I haven’t read that many Warhammer 40,000 novels, but I’ve enjoyed the ones I’ve read. For those of you unfamiliar with them, these books are a rather odd mix of far-future space opera and gothic horror, featuring various groups of Space Marines who do battle for their emperor against not only aliens but also demons and other supernatural monsters. They’re related to the Warhammer sword-and-sorcery novels (both series are based on role-playing games produced by the same company, after all), but they can be read independently of each other. 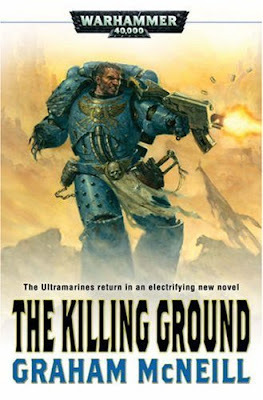 THE KILLING GROUND is the fourth book in the Ultramarines series, featuring a couple of rugged Space Marines, Captain Uriel Ventris and Sergeant Pasanius Lysane. Picture, say, Gunner and Sarge in the far future, with no Pooch, for those of you with long memories of DC war comics. This is the first one I’ve sampled from this series, as well as the first thing I’ve read by author Graham McNeill, and while it’s very unusual for me to jump into a series in the middle – I’m obsessive enough to feel like I have to read a series from the first, in order – I didn’t have any trouble getting up to speed on the story, which says something for the author’s skill. Escaping from the calamitous events in the previous book, Uriel and Pasanius find themselves on the planet Salinas, which has a grim, bloody past and now finds itself engaged in guerrilla warfare as rebels battle against the local governor. As space-hopping science-fiction heroes always do, the two Ultramarines wind up being forced to choose which side they want to be on. I’ve come to expect big, sprawling action scenes in both Warhammer and Warhammer 40K novels, and in that respect, the first half of THE KILLING GROUND sort of disappoints. The pace is a little slow, as McNeill spends a lot of time setting up the conflict on Salinas. But the second half of the book makes up for that with plenty of action. Stuff blows up real good, to say the least, and McNeill conjures up a number of bleak but striking images. Also, Uriel and Pasanius are really likable heroes and the reader can’t help but root for them. It took me longer than usual to read this book, which is usually a sign that I don’t like what I’m reading. That’s not the case here. I’ve just been really busy and haven’t had much time to read. I thought THE KILLING GROUND was very good and liked it enough that I’m definitely going to search out the first three books in the series and read them, too. If you think you’d like space opera with some horror elements blended in, I recommend it. I suppose it’s hard to consider any Louis L’Amour novel to be truly forgotten, since they’ve all been in print for decades, some for more than fifty years, including this one originally published in 1955. 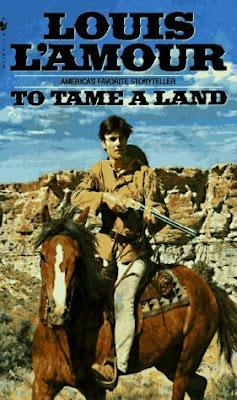 But of all the L’Amour novels I’ve read (about two-thirds of them), TO TAME A LAND is my favorite, and it’s also one that nobody talks about much. 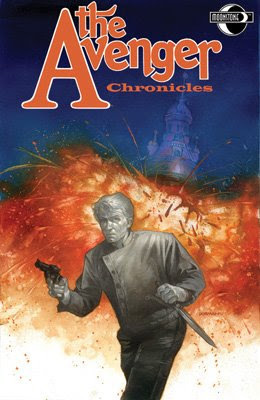 This novel is an expansion of the novelette “We Shaped This Land With Our Guns”, which appeared in the April 1951 issue of the pulp TEXAS RANGERS. Its narrator is a likable young man named Rye Tyler, who, in the course of the novel, takes part in virtually every sort of Western plot that’s ever been invented. He’s a pioneer, along with the rest of his family. He fights Indians. He scouts for the army. He drives cattle, saves the ranch from rustlers, becomes a reluctant outlaw himself, reforms, becomes a lawman . . . You get the idea. If it’s a standard Western plot, it’s in TO TAME A LAND. That’s why I sometimes tell people that it’s the best example of a “kitchen sink” Western ever written. Yet in L’Amour’s hands, what could have been nothing more than a gimmick novel becomes something else: a tautly written epic that rings true from start to finish. Knowing some of the history of the West, it’s not all that far-fetched that Rye Tyler could reinvent himself time after time. Plenty of people involved in the settling of the West did just that. TO TAME A LAND is also important because it’s a precursor to L’Amour’s lengthy Sackett saga, only instead of spreading out the action through an extended family, it’s all embodied in Rye Tyler. This book also contains some of L’Amour’s best writing. The final showdown between Rye and his mentor/nemesis (a theme that shows up again and again in L’Amour’s work) is a wonderful scene. I’m not as big a fan of L’Amour’s books as many Western readers are, but when he was at the top of his game he was very, very good indeed, and he wrote several novels that I consider classics. I’d also put FLINT and THE DAYBREAKERS (the first Sackett novel) in that category. But TO TAME A LAND is the best of them all, as far as I’m concerned. I don’t have a copy of it to give away, but it shouldn’t be hard to find if you're interested in reading it. My brother and one of my nephews came over today to install a TV antenna on the new house. Out in the country where we are, we can’t get cable TV, so we just watch broadcast. Maybe we’ll go the satellite route eventually, but not now. So, the modified brackets work great, the antenna is mounted right up at the peak of the roof, and a nice long length of coax is attached to it. Then my brother hauls out another piece of equipment he brought with him: a Spectrum Analyzer, with enough buttons and dials on it that I think in a pinch you could use it to talk to the space station. (My brother does talk to the astronauts on the space station, but that’s another story.) He hooks the coax to the Spectrum Analyzer and then goes back up the ladder to rotate the antenna until it gets the strongest signal. If you have one of these babies, you don’t have to hook the antenna to the TV and then have somebody watch it and yell out when the picture gets better. You get the best signal locked in before any TVs ever get hooked up. After that comes the clambering around in the attic and hooking the coax to the signal amplifier and then sorting out the cables that go to the various wall plugs. Even though we haven’t moved in yet, when we do we should have the best TV reception we’ve ever had out here. So we’re one step closer, and I had a good time helping out, even though I didn’t actually do much. 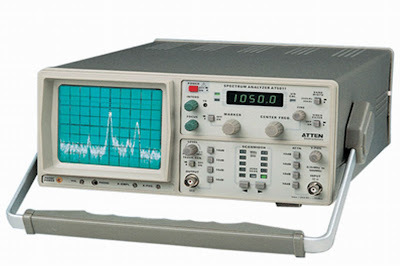 I sure got a kick out of that Spectrum Analyzer, too. 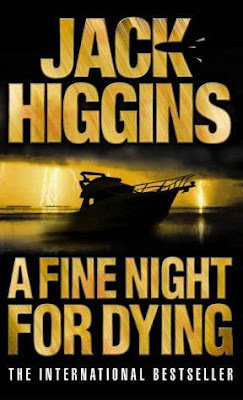 Over the years I’ve read a number of books by Jack Higgins (whose real name is Harry Patterson) and enjoyed them all, but I haven’t read anything by him in a while. To remedy that I picked up a recent reissue of A FINE NIGHT FOR DYING, originally published in 1969. This is the next-to-last book in a series about British secret agent Paul Chavasse, which was first published under the pseudonym Martin Fallon and later reprinted under Patterson’s better-known pen-name. I hadn’t read any of the Paul Chavasse books until now. There’s a certain similarity to James Bond: Chavasse reports to an M-like boss who has a flirtatious secretary like Miss Moneypenny, and Chavasse can also be brutally and efficiently violent when he needs to be. That’s pretty much where the similarities end, though, at least in this book. Although it has an international espionage angle, at heart it’s really a gritty little crime story about a ring of smugglers who bring people without visas into England. Chavasse is given the assignment of breaking up this smuggling operation, and to do so he has to pretend to be a fugitive from the law himself. This is a tightly written book, the sort of lean little British thriller that doesn’t get written much anymore, if at all. A couple of years ago I read a debut thriller from an author who has gone on to be a best-seller. I remember thinking that it had a pretty good plot, but Nick Carter could have handled the same plot in a third as many pages. The same is true of Paul Chavasse. There are no wasted words here. Despite that, the story didn’t really draw me in until the extended action sequence that closes the book. The plot doesn’t have much in the way of twists and turns; the only real “surprise” is telegraphed early on. But the action scenes are very good, and in the end I enjoyed the book enough to make me want to read more of Higgins’ work again. I’ll probably pick up another of his novels soon. If Charles N. Heckelmann is remembered at all today by paperback fans, it’s probably as the founder and editor of Monarch Books or the editor at Popular Library during the Sixties. However, before that he worked as a writer and editor in the Western pulps, most notably those in the so-called Thrilling Group, and he continued writing Western novels from the late Forties throughout the Fifties. He was never very prolific as an author, but his books were well-regarded in their time. 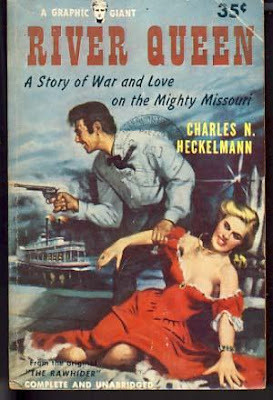 I just read my first Heckelmann novel, RIVER QUEEN, and it’s a good one. That’s the title of the Graphic Books paperback reprint. The novel first appeared in hardback from Henry Holt under the title THE RAWHIDER. RIVER QUEEN is actually the better and more appropriate title. This is a riverboat book, set largely along the Missouri River in Montana Territory, although the first section of the story centers around the battle of Shiloh during the Civil War. Bill Horn is the captain and pilot of the riverboat Western Star. His main rival on the river is Kay Graham, the beautiful female captain of the Queen. Both of their boats wind up being hired by the army to carry troops and supplies up the Missouri River to help deal with the rising threat of the Sioux, who have started raiding the settlements there because the army is stretched so thin due to the war. There’s also a romantic triangle going on, as well as an old enemy of Horn’s who is now a Jayhawker, ostensibly helping the Confederate side while really being out for all the loot he can get his hands on. Why this novel was never adapted into a movie starring John Wayne, I’ll never know. Bill Horn seems to be a perfect character for the Duke to play, and considering the way Heckelmann describes him, I wonder if he thought the same thing. Barbara Stanwyck would have been great as Kay Graham, and the villain cries out to be played by Forrest Tucker. It’s not really a John Ford or Howard Hawks type of story, but in the hands of a director like Michael Curtiz or Henry Hathaway . . . Well, never mind. There’s no such movie. But it would have been a good one, because Heckelmann has packed a lot into this book: epic battles, romantic intrigue, mano a mano showdowns, and a little reasonably accurate history. The action scenes are really good, and my only real complaint is Heckelmann’s occasional tendency to slow down the story in order to explain the backgrounds of some of the characters. This is especially annoying early on, but once you get past the first chapter or so, the action never flags for very long. I enjoyed this one enough that I definitely plan to read more by Heckelmann. This week marks the beginning of a new wrinkle in my Forgotten Books posts. From time to time I’m going to give away the books I’m writing about. People have been incredibly generous this year in sending books to me after the fire back in January, and I’d like to pay back that generosity in small part by passing on some of the books that I’ve read and enjoyed. Just to clarify, I’m not giving away any of the books that were sent to me. Those occupy a special place in my new collection. These will only be books that I’ve bought myself. So here’s how it works: if you want this copy of RIVER QUEEN, it’s yours if you’re the first person to email me asking for it (not by posting a comment in the comments section). There’s an email link in my profile, if you don’t have the address already. I’ll update this post as soon as the book is spoken for. It’s that simple. I’ll probably be doing this with some of the other books I post about, too, not just the Forgotten ones on Friday. This copy of RIVER QUEEN isn’t in top-notch shape, but it’s all there, so if you’d like to read it, this is your chance. Update: This book is now spoken for, but I'll be giving away more in the weeks to come. Back to more traditional superhero fare . . . Even though I grew up during the Silver Age of Comics, I’ve always been a fan of the Golden Age characters, too, as far back as I was aware of them. Which is pretty far, because “Flash of Two Worlds” and AVENGERS #4 featuring the return of Captain America were some of the first issues I read when I became a serious fan. 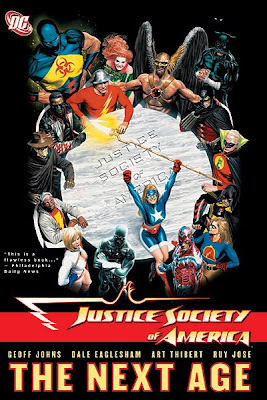 I always enjoyed the annual crossovers between the Justice League of America and the Justice Society of America, and I still have a soft spot in my heart for the JSA. So it comes as no surprise that I enjoyed the recent relaunch (one of many) of the JSA. This one features three of the original members, Green Lantern (the Alan Scott version), The Flash (the Jay Garrick version), and Wildcat (a long-time favorite of mine) trying to recruit the grown-up children of some of the original members for membership in the Justice Society. Some of these recruits are even grandchildren of the original members. But even as this effort is getting started, along come some mysterious super-villains who seem bent on wiping out these descendants of former JSA members, along with all the members of their families. One thing about modern comics, the body count is certainly higher that it was in the Silver Age, and that’s true here. But that really raises the stakes for the heroes involved. Other than that, this collection has a definite old-fashioned feel to it. Some might call it “retro” or “classic”. Me, I’m fine with old-fashioned. I like old-fashioned. I got a big kick out of the trio of geezer super-heroes at the core of this story, and even though a lot of the younger characters – or younger versions of old characters – were new to me, I liked them as well. The script by Geoff Johns works in a lot of comics history, which I appreciate, and the art by Dale Eaglesham is really good. JUSTICE SOCIETY OF AMERICA: THE NEXT AGE is a lot of fun, and I recommend it highly, especially for comics readers who remember the Silver or even the Golden Age. I guess I’ve just been in the mood for bizarre comics recently, and WE3 certainly fits that description. This ain’t no funny animal book. 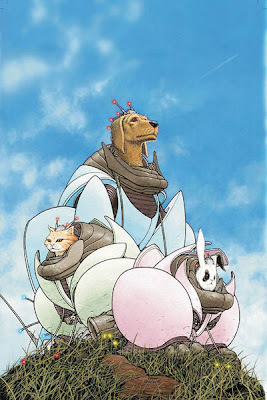 Instead, it’s a gritty, near-future, science fiction yarn about three pets – a dog, a cat, and a rabbit – that are kidnapped by the government and bio-engineered so that they can operate heavily-armored and heavily-armed battle suits, the purpose of this experiment being to see if someday animal armies might be able to replace human ones. But, as always happens in stories like this, Something Goes Wrong. The animals, who can now speak and refer to themselves as 1, 2, and 3, get loose, and the government tries to hunt them down before they can hurt any civilians and/or expose the experiment to the public. As you might imagine, bloody chaos ensues. I wouldn’t recommend WE3 to everybody. Grant Morrison’s story and Frank Quitely’s art are rather disturbing at times. But they generate a lot of suspense and more than a few poignant moments, too, especially if you’re an animal lover like I am. And no matter how you think this story is going to end, you’re probably wrong. I know I was. Overall, this is one of the best graphic novels I’ve read in quite a while, and while I say again that it won’t be for everybody, I really liked it. This is a far cry from my usual comics reading, which tends toward the traditional (Superman, Batman, other super-heroes, Westerns, war comics, etc.). 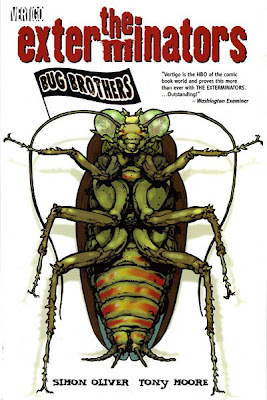 THE EXTERMINATORS: BUG BROTHERS reprints the first five issues of a relatively new series from Vertigo/DC and centers around the largely dysfunctional lives of the men and women who work for a pest control company in Los Angeles. The narrator is Henry, a recently paroled ex-con whose stepfather owns the company. Unless I missed it, I don’t think the story ever mentions why Henry went to prison, but in this first volume, at least, it doesn’t really matter. He’s an intelligent, flawed, but ultimately likable protagonist. As the story begins, he’s partnered with an exterminator named A.J., who’s just as despicable and repulsive as the vermin they go after. Along the way Henry is also teamed at various times with Stretch, a black Buddhist cowboy, and Kevin, a fundamentalist Christian. There’s also Henry’s girlfriend Laura, who works for the company that makes the poison the exterminators use on roaches. This is more than just a bizarre soap opera, though. It’s also a bizarre scientific/conspiracy thriller, because the vermin encountered by the exterminators are getting steadily larger, more aggressive, and even intelligent, especially the cockroaches. Could the new poison they’re using have some connection? Well, of course it does. Does the evil corporation have some hidden agenda, possibly connected with the government? You know the answer to that as well as I do. But despite those areas of predictability, the script by Simon Oliver (a newcomer to comics; I think this series was his first published work) is funny and well-paced, and he’s created some interesting characters. I like the art by Tony Moore, too, which is easy to follow and suitably grotesque when it needs to be. Overall, I enjoyed THE EXTERMINATORS quite a bit, and I’d certainly read more in the series. I warn you, I’m going to digress a little here. 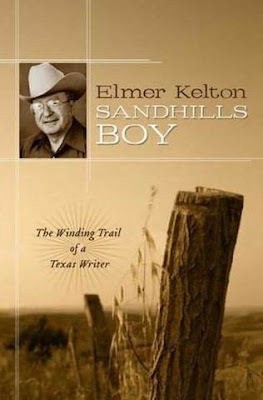 Elmer Kelton was my father’s favorite author, although I’d like to think that my dad thought my books were pretty good, too. But Elmer’s work really struck a chord with him. They were roughly the same age, both came from a rural Texas background and had cowboyed some as kids, both were in the army and stationed in Austria right after World War II, and as it turned out, they had some mutual acquaintances. So when I took my dad with me to the Western Writers of America convention in Jackson, Wyoming in 1992, he was excited to meet Elmer, who I had known since ’86. Now, my dad was always supportive – in his way – of my desire to be a writer. Oh, he thought I was crazy, no doubt about that. He didn’t see how anybody from our small town could ever make a living writing books. Writers were all folks who lived somewhere else. But he did everything in his power to see to it that I had the chance to succeed or fail on my own, and nobody can ask for more than that. Even after I broke in and started selling books, my dad didn’t quite grasp what was going on. But then, at that WWA convention, when he saw Elmer greet me by name and shake my hand, my dad’s attitude changed. By golly, if I was friends with Elmer Kelton, then there had to be something to this writing business after all. He got to talk to Elmer at length, and that was when they discovered they knew some of the same people and had been to many of the same places, in both Austria and West Texas. It was fun watching them talk, because they obviously spoke the same language. We spent that weekend hanging around not only with Elmer but many other writers, editors, and agents as well, and from that point on, my dad was more interested in the writing business than ever and managed to pick up quite a few of the intricacies of it. We spent hours talking about it, and those were some great times. Now, back to Elmer Kelton. SANDHILLS BOY is his autobiography, and it’s a fine book, written in his usual straightforward style. He begins by covering several generations of his family that came before him, painting a vivid picture of their interaction with the somewhat harsh West Texas landscape, then launches into a lengthy section about his boyhood on the ranch that his father managed. It’s good stuff, humorous and poignant in turn, and along the way he mentions his mother reading the pulp RANCH ROMANCES, a magazine that would prove to be quite important to him later on. The second half of SANDHILLS BOY deals primarily with Kelton’s service as a combat infantryman in Germany during World War II, and then his romance with Anni Lipp while he was stationed in Austria during the year following the war. They weren’t able to get married until after Kelton returned to America and was discharged from the army, and then only after another year of dealing with all the bureaucratic red tape involved. The final few chapters center around their lives since then, including Kelton’s duel careers as an agriculture journalist and a novelist. This is not really a literary autobiography. Kelton mentions making his first sale to RANCH ROMANCES and touches in passing on becoming a novelist. It would have been fine with me if he had gone into more detail about that part of his life – I’m a sucker for the “And then I wrote”-style of autobiography, although I know some people don’t care for it – but hey, it’s Elmer’s book, and Elmer’s life, for that matter, and he can write about what he wants to. Especially when it’s in such eloquent, compelling prose. His unassuming personality really shines through in this book. There’s no sense that he considers himself any more special or important than any of the other cowboys, ranch women, or soldiers he describes. That’s one of the things that makes him the man he is, and one reason this book gets a high recommendation from me. I had never heard of this novel or the author before reading it. 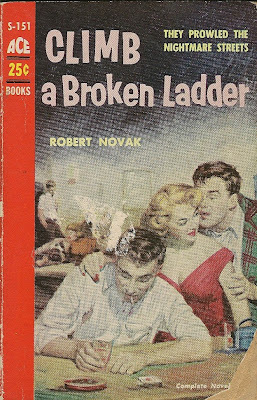 There’s a political columnist by the name of Robert Novak, but I have my doubts he’s the same guy who wrote CLIMB A BROKEN LADDER and B-GIRL, both published in 1956 by Ace and as far as I’ve been able to determine, the only two books by this author. CLIMB A BROKEN LADDER is a low-life novel, I guess you’d call it, a story about the drunks, beggars, and prostitutes who live along Seattle’s skid row, characters with colorful names like the Bohunk, Big Phil, Newsy Nellie, and Pushover Patty. Though not as well-written, it reminded me of what I’ve read by Charles Bukowski, since a lot of the book finds the characters just wandering around in an alcoholic haze. This makes for a pretty meandering plot, but the story does have a coherent thread running through it, that being the budding romance between the Bohunk and Newsy Nellie. The book picks up steam in the final third with a twist or two that I didn’t see coming. It never quite becomes the noir crime novel that I thought it might, but it’s dark enough to please most readers of noir. One thing I really liked about the book is its Seattle setting. I expect most skid row novels to be set in New York or San Francisco or some place like that. Novak also does a good job of working in the back-stories of the various characters, and then at the very end throws in a final plot twist that left me going, “Huh,” even though I wouldn’t go quite so far as to call it jaw-dropping. This is a pretty stark book that impressed me enough I may have to try to find a copy of Novak’s other novel, B-GIRL. 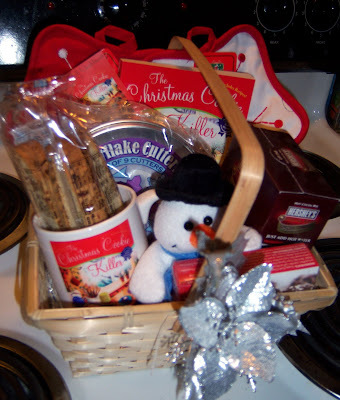 Livia's running a contest over on her blog to give away a basket containing a signed copy of THE CHRISTMAS COOKIE KILLER, a mug, cookies, chocolate, and other assorted goodies. This is some good swag. Head on over to check it out. It’s an indication of how long I’ve been reading comic books that creators such as Roger Stern and John Byrne are considered old-timers in the business (and rightly so), while unless I stop and think about it, they seem like relative newcomers to me. The new trade paperback JLA: THAT WAS NOW, THIS IS THEN, which reprints a five-issue story arc from the comic JLA CLASSIFIED, is definitely a little old-fashioned in its story (by Stern) and its art (by Byrne) – and that suits me just fine. 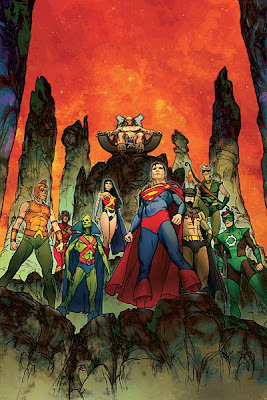 It centers around some of the core characters in the DC Universe – Superman, Batman, Wonder Woman, The Flash, Green Lantern, Green Arrow, Martian Manhunter, Aquaman, and Black Canary – battling in both the past and the present against a super-villain who’s new to me, the alien strongman called Titus. Because of the flashbacks involved in the story, we get to see old favorites Barry Allen and Hal Jordan in action as The Flash and Green Lantern, respectively. Call me a curmudgeon if you will, but I’ve never really warmed up to the newer incarnations of those characters, although I don’t mind Wally West being the current Flash all that much. This is a straightforward super-hero vs. super-villain battle story (what we used to call a slugfest in earlier days), and I thoroughly enjoyed it. As I’ve mentioned before, I’m a big fan of the classic Justice League of America, and if you are, too, I think there’s a good chance you’d like this yarn a lot. 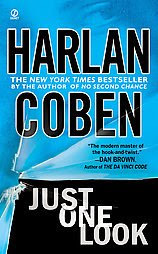 Harlan Coben’s JUST ONE LOOK has to be the most complicated novel I’ve read by him so far. In fact, there are so many characters and plotlines introduced in the first fifty pages or so that I figured there was no way he could tie all of them together and have it make any sense. The main plotline involves suburban New Jersey artist/wife and mother Grace Lawson, who finds an odd photo among some other pictures she’s had developed at a local photo store. It’s an old photo of a group of five college-age people, and Grace thinks one of them might be her husband, whom she didn’t meet until after college. When her husband Jack sees the photo, he takes off without any explanation and disappears, prompting Grace to launch an investigation to find out why he ran off and what has happened to him. As Coben reveals to the reader, Jack Lawson is soon captured by a mysterious Korean assassin who starts slaughtering people right and left. Then you’ve got a former hitman, a U.S. attorney with secrets of his own, gangsters, rock and roll bands, a peeping tom, enigmatic figures pulling strings behind the scenes . . . You get the idea. This is one crowded book. Still, JUST ONE LOOK is a very entertaining novel that really kept me turning the pages. I’ll definitely read more of Coben’s work, but probably not for a while, because I don’t want to risk getting burned out on his books. 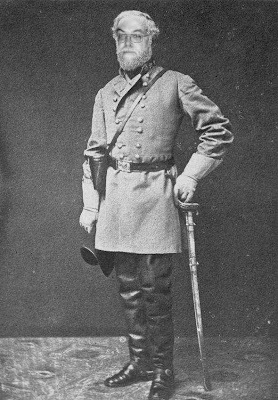 A friend of mine sent me this photo of me as a Confederate general. The last time I saw something like this, the result was the Judge Earl Stark series. So you're bound to know what I'm thinking . . . Sorry no Forgotten Books post today. I just never got around to it. I've been writing a lot this week, plus there have been numerous details to deal with on the new house, which is getting closer and closer to being finished. Then there's the new series I'm in the process of creating with one of my editors (mostly his idea, but I'll be doing a lot of fleshing out on it). Earlier this week I had to go up to Denton, so of course I stopped at Recycled Books. Didn't find much this time, however, other than a few more William P. McGivern novels. I've been having more luck lately finding vintage paperbacks at Half Price Books, for some reason. So there's my week in a nutshell. Gary Dobbs, aka Western author Jack Martin, has a very nice article/interview with yours truly posted today over at the Tainted Archive blog. Thanks, Gary, for all your kind words. I’m not much of a manga fan. I don’t like a lot of the artwork, and reading right to left always throws me. However, I’m willing to give one a try every now and then when it looks interesting, and as you can see from the cover, if you’re a Batman fan like me, this definitely looks interesting. And as it turns out, BATMAN: DEATH MASK is a really good graphic novel. 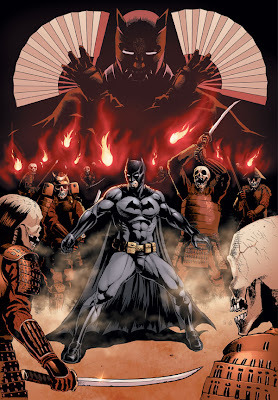 The story finds Bruce Wayne getting involved with a somewhat shady Japanese industrialist and winds up with Batman embroiled in an action-packed plot featuring murder victims who have their faces sliced off, a Japanese ceremonial mask with an ancient curse on it, a beautiful young woman who’s a dead ringer for one of Bruce Wayne’s old lovers, flashbacks to Bruce’s martial arts training in Japan before he becomes Batman, evil secrets from the past rising up to menace the present like something out of a Ross Macdonald novel, and a bunch of American gangsters. Whew. As you can tell, the pace in this story never slows down much. I even got used to reading backwards. The story and art are by Yoshinori Natsume. Needless to say, I’d never read any of his work before. But I certainly would again, especially if it was another Batman graphic novel, because DEATH MASK is one of the best Batman yarns I’ve read in quite a while. My author copies of THE AVENGER CHRONICLES arrived today. This is a new collection from Moonstone Books featuring eighteen stories starring the pulp character whose relatively short-lived series (24 novels) was reprinted in its entirety in paperback by Warner Books during the Seventies. Those reprints were so successful that Warner published twelve new Avenger novels, all ghosted by Ron Goulart under the house-name Kenneth Robeson. 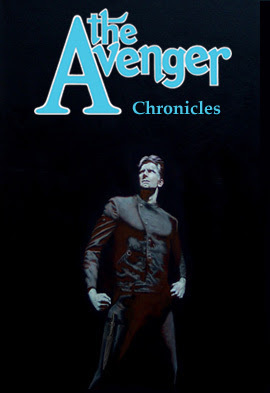 Goulart is back with a new story in THE AVENGER CHRONICLES. Other authors include Howard Hopkins (probably the world’s leading authority on the character), Bob Randisi, Gary Phillips, Will Murray, Paul Kupperberg, C.J. H enderson, Richard Dean Starr, Mark Justice, Joe Gentile, Mel Odom, Martin Powell, Win Scott Eckert, Tom DeFalco, Matthew Baugh, Clay and Susan Griffith, and Dan Wickline. You get not only a fine lineup of writers, but also some fine artwork, including two variant covers. My story is called “Death in Clown Alley”, and I had a fine time writing it. Where else am I going to get to write about skeleton clowns raising havoc under the Big Top? One of the great joys of this business is that from time to time you get to write about characters whose exploits you enjoyed in your younger days. That happened to me with Mike Shayne, Longarm, Kolchak, and now The Avenger, all of whom entertained me long before I ever became a writer. I’m not old enough to remember The Avenger’s pulp run, but I bought and read all those paperback reprints in the Seventies. While The Avenger wasn’t my favorite pulp character (that honor goes to Doc Savage), I thoroughly enjoyed those original yarns, written by Paul Ernst under the Robeson house-name, and I appreciate the opportunity to add to his adventures.